Last week I stumbled upon a way to engage students in reading complex poetry. It was a wonderful, magical moment--made even more enchanting by the fact that students were completely immersed in a poem twenty minutes before dismissal a week before the holiday break! I love to start our study of poetry with accessible, easy poems that students can read and decode without much effort. After some success with these poems, students are much more willing to read more complex poems that require more thought. I have loved John Masefield's "Sea Fever" ever since I first read it in my seventh grade literature anthology. (Oh, I adored that book--a huge volume of different stories and poems!) 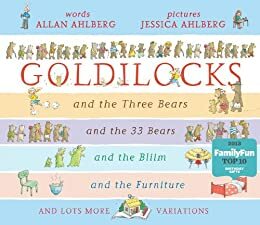 It is a perfect poem to read and revisit during a poetry unit, as it can be discussed in many different ways, looking at speaker, speaker's attitude, figurative language, and more. But how could I introduce it in a way that would engage students? I decided to try out Keynote for this. I quickly put the poem into Keynote, using a different slide for each line and a different background for each stanza. On a snow day, I recorded myself reading the poem in Keynote, and then took it over to iMovie, where I added some ocean sound effects. The entire process took about an hour. I wanted students to have experience with this poem over multiple readings. For our first reading, I had pretty low expectations--I just wanted to see if students could connect their printed version with the video version. Could they find the way that I had marked the different stanzas? It turned out somewhat differently. Students noticed the marking of the different stanzas on our second viewing, with lots of comments along the way. ("Is that you?" "Wow!" "Why don't you talk like that during class?") With ten minutes left in class, I decided to show it one more time as a choral reading, inviting students to read along. But students had different ideas. They couldn't help but call out their questions. I paused on the line with a star to steer her by when one student asked, "Why would you steer with a star?" Another answered, "Oh! They must have looked at the constellations!" We hadn't progressed much more when we got to the wheel's kick and the question, "How can a boat have wheels?" This didn't need much discussion--I just pantomimed steering a boat with the wheel and said, "You know, the big wheel they use to steer with." By this point I realized that the choral reading wasn't happening. In fact, it had evolved into more of a close reading--students were really focusing on each line, carefully considering the meaning. I have taught this poem many times, but I have never had students try to get so much out of it. Feeling brave by the end, I asked, "Who is the speaker?" Of course, some answered, "You are," because I was the one reading the poem. But another student protested. "No, she's reading it, but she's not the speaker. The speaker is inside the poem." Tentative answers were offered--"The speaker is someone who likes the ocean" "A person who works on a boat". Several things came together to make this lesson work well. First of all, I chose a high-quality poem to share. Something about this poem resonates with students--we are about 4 hours from the beach, close enough to visit every summer or two, but far enough away that students really do feel that longing to get back to the beach. The visual format of the poem also changed the experience for students. Many of the readers in this group have trouble accessing the right background knowledge to help them visualize effectively. The simple photographs in the video gave them a cue to access their "beach scenery" schema. Also, showing the poem one line at a time helped to give students a clear focus. Finally, I have to remember to keep an open, encouraging attitude, especially when we look at text for the first time. I went into this with a very low-level expectation for a first read. The students totally overwhelmed me by going beyond my expectations. I knew where I eventually wanted to go, and so I could steer the conversation onward when students showed that they were ready. But it was so wonderful to have students move beyond what I expected, instead of feeling like I was in the position of "pulling teeth" to get students to an expected level of understanding. This is something worth remembering for the rest of the poetry unit and beyond. The snowflakes are flying! Today's snow in Pennsylvania was the kind I especially loved as a child...a layer of 3 inches of snow covered by about half an inch of ice. It makes a satisfying crunch as you break through the top layer and step into the snow. It's also especially fun to break apart into big sheets. Snow presents some great opportunities for easy science investigations. 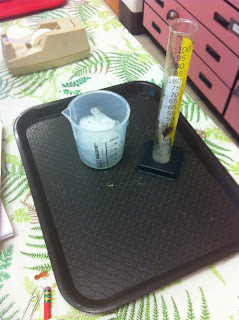 Today, we looked at the volume of snow and watched what happened when it melted. It doesn't get much simpler than this! I took this picture mid-morning, after some of the snow had melted. We started out with 100 mL in the graduated cylinder and 250 mL in the beaker. The boys who got to go out to the playground to collect the snow also filled out a chart that I had made with their classmates' guesses about the final volume of the water. Interestingly, the boy who filled the graduated cylinder used more of the fluffy snow from underneath the ice layer, while the boy who filled the beaker used mostly ice. Did this have an effect on the final volume? Absolutely! Review of volume: My fourth graders still have trouble with the use of milliliters to measure volume. Talking about the initial volume and the final volume gets the word "milliliters" in use over and over again. Predicting and checking: The routine of making a prediction and then checking the real-world results is always engaging and helpful. Results will vary over several days as the snow changes. States of matter: This activity helped us to think about the change of water from solid to liquid. Some students expressed surprise at the final volume of water--"Where did it all go?" 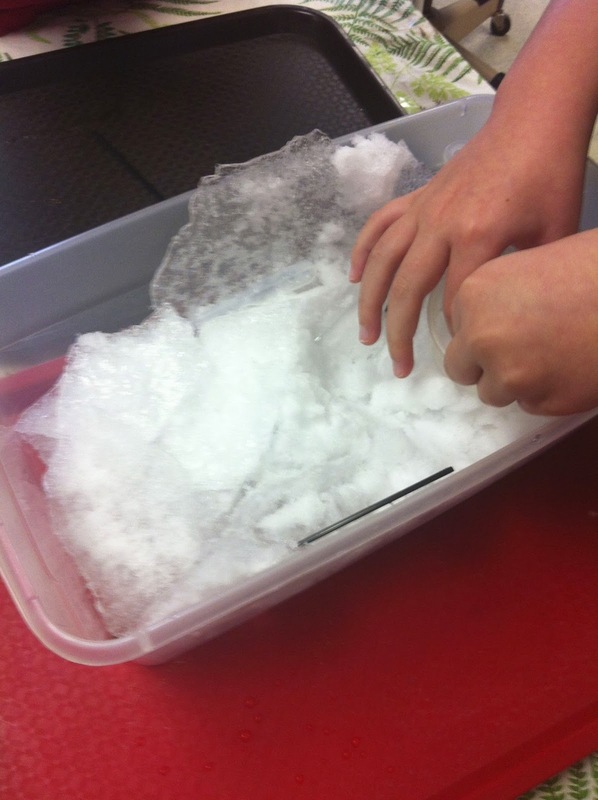 At recess, I filled a tub with a collection of snow and ice and let students handle it for short periods of time. 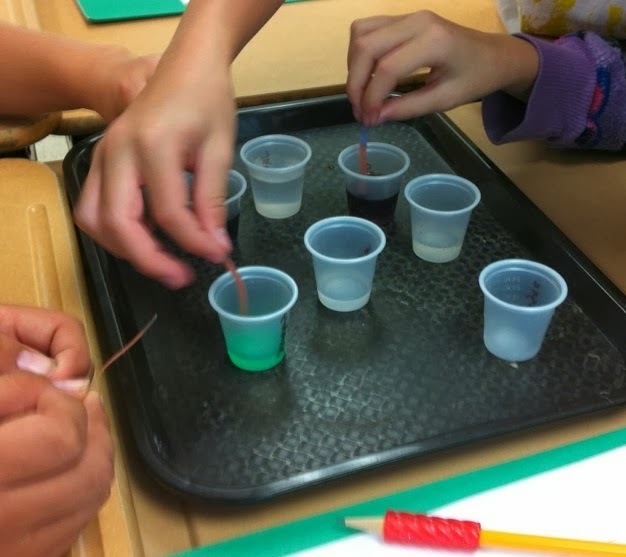 Students noticed that the ice sheets bend light ("they work like glasses!") and that the snow changed when they handled it. All afternoon, they stopped by the science table to check on the progress of our snow--"I can't believe it hasn't melted yet!" The forecast calls for more snow for tomorrow. If we have school, I hope to capture some snowflakes on some black paper; then we can talk about the shapes that we see. Ken Libbrecht has an amazing site with a guide to snow crystals, and I also have his book, The Secret Life of a Snowflake. Of course, all of this snowflake study will go quite nicely with our poetry unit...lots to write about with so much snow! Of course this poem sparked discussion. How can a candy cane by hot? How can it burn and chill? Luckily I had a bag full of starlight mints--close enough to a candy cane--that I could hand out to the students. 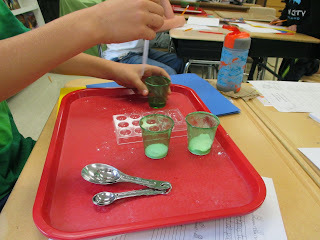 We talked about how our experiences with the mints were similar to the poem, and how they were different. Along the way, I was also able to listen to what kinds of language students were bringing to the classroom. How were they describing the poem? I only heard the word "stanza" once, which told me that this was not a well-known concept in the room. Today, we explored the idea of lines and stanzas. We looked at poems with short lines, long lines, and multiple stanzas. (I used the PowerPoint in the Poetry Unit for Poetic Structure, but you could easily do this with any poems.) This is so important because students need to know how to navigate a poem. Once they know about lines and stanzas, we can quickly talk about how to get to a particular spot. After a whole group lesson, we did a carousel activity. Students rotated to different poems that I had around the room and described them--title, lines, stanzas, and a picture to represent the main idea. I watched to see if they could record the title of a poem with quotation marks (some used parentheses instead!) and listened to their conversations to see if certain words came up. I hoped to hear alliteration, personification, and simile....but I didn't. When I introduce them, students may recall what they've learned before. At this point in time, however, students don't have access to these words to talk about poems. Good to know! And finding this out from a busy, talkative activity is so much nicer than learning it from an assessment. Finally, students had some free time. Some chose to escape from poetry and go right back to their independent reading books. (The Amulet series is hugely popular in my room right now.) Others started to try writing some poems. (Alas, many jumped right into acrostics...looks like I'll have to break out the book Silver Seeds to talk about meaningful acrostics.) Still others read from their poetry collections, a book of poems that I have put together to use as our core resource for our poetry unit. All in all, it was a nice start to our precious few days of focusing on poetry. This week, as I was cutting down the remains of last summer's garden, I thought about how lucky it is that my classroom and my garden work as opposites. In June, as I am feeling the deep sadness of a vanished learning community, my garden eagerly clamors for attention. In November, just when the summer garden is completely gone, my classroom "garden" of learners and excitement is entering full bloom. And what a bloom it is! I have a class of students with lots of enthusiasm and ideas, and they have brought many interesting ideas. Clubs have been all the rage this year--kids love making sign-up sheets (of course, everyone who wants to join must be included), having club meetings at recess, assigning club homework, and then complaining when club members don't attend meetings. It seems that the process of making the sign-up sheet and making announcements to the class is the most exciting part of this. On the other side of the room, a group of students is making a play. Another student has taken on the task of writing the morning message each day, and another is writing a story. There are smaller moments, too--the girl who is making a PowerPoint about Greek mythology, the student who created a cupcake analogy to describe summarizing, the boy who is writing his own story for us to act out during reading class. So the question arises of how to capture all of this activity. Even though I have 100+ data points on our standards-based report card, I cannot imagine turning any of these rich experiences into a number or a letter. They are more than that. I found a way to capture the learning as I was browsing the Graham Nuthall Classroom Trust to see if there were any new newsletters. I've been fascinated by the work of Graham Nuthall ever since I worked on the Forest and the Trees book. In one of the newsletters, I read about the idea of Learning Stories. 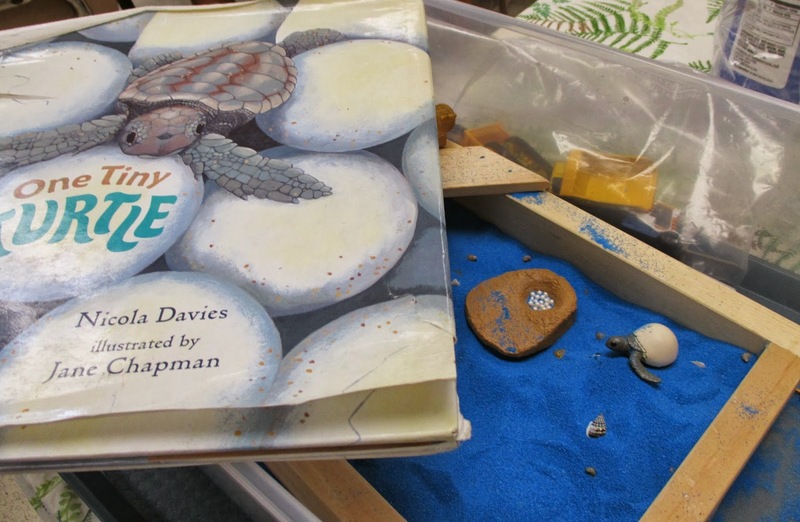 In early childhood settings, learning stories are used to describe and interpret the learning of young children. I was intrigued by these stories and wondered--how could I do this at my level? I quickly made a binder to collect the Learning Notes. Then, I started looking around for what to write about. It didn't take long! These are some of the quick little notes that I've written over the last two weeks. Will every student get a learning note? Not at first; I'm averaging only one per day. 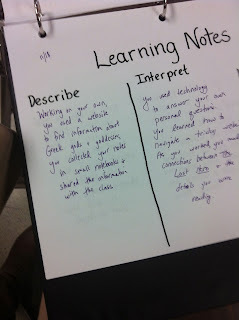 But I hope that these notes will help to create a culture of learning in my classroom. I'm still thinking about whether I want to display them (with student permission, of course) or keep them in a binder. In a time of year when I often start to despair a bit about the upcoming state testing, these learning notes help me to focus on the small moments that really matter. 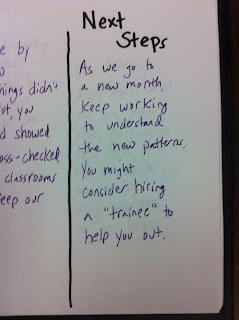 By the end of the year, my copy of the Learning Notes will be a wonderful memento of our classroom garden. I finished December Homework! These were so much fun to write. I'm working to get the texts up over on Frolyc as well. Then, they would be available digitally for students with iPads with the free Activity Spot app. Write to let me know if you'd be interested in this! I am deep in the Personal Narratives unit right now. Today we worked on adding paragraphs to a personal narrative--such an important topic for fourth grade writers! "Mrs. Kissner! Mrs. Kissner! Can I read my words to you?" This has become a common question in my classroom during arrival time, dismissal time, and any spare moment that might arise. It is an interesting side effect of a vocabulary routine that I started this year. In the past few years, I have come to see vocabulary as a huge issue in my classroom. Fourth grade readers are moving into more complex, difficult text. Many of the new words that they encounter are not typically heard in everyday speech. Unfortunately, wide reading alone is not enough to help students build their word knowledge. (This pdf from Scholastic is a great source of background information for teaching vocabulary.) More instruction is needed. But what could I do to incorporate this instruction in a meaningful way? When creating new content for the classroom, it's often easiest to work in steps. I knew that a comprehensive vocabulary program was my eventual goal. But this is a huge thing to accomplish. What little steps could I implement right now, each week, to get on my way? Last year, I experimented with vocabulary lists for texts that we shared in the classroom. As I built my reading homework packets, I pulled five words out from each text. Some of these words matched the master list of academic words that I had compiled two years ago. Others were words that I knew to be common in fourth grade texts. This year, I added a new component to the weekly homework/quiz routine. After some paper engineering help from my ninth grade son, I created easy double-sided flashcards. I attach these flashcards to rings so that students have an easy to keep set of words. Many students are still working on decoding multi-syllabic words, so these flashcards are helpful for them to practice pronouncing the words. With the definitions on the back, the flashcards also help students to learn the meanings. But independent practice wasn't enough. So, with a fancy paper punch from the craft store, I added another step (borrowed from sight word work! ): When students can read the word correctly and explain what it means, they get a punch on the card. When they have three punches, the card can be removed from the ring. There are many benefits to this routine--both expected and unexpected. One expected benefit is that it is easy to explain to instructional assistants, substitutes, and volunteers. I keep a clipboard with a list of student names and anyone who reads words with kids can mark the date next to the student's name. Even our sixth grade tutors help out. When students are working independently or have completed a task, they can also come and read words with me. Each individual kid usually reads words with an adult once every week or so. An unexpected benefit is that this becomes such a verbal, conversational interaction. Fourth graders love individual attention and sharing stories. Talking about these words has become a way to frame our conversations and make sure that everyone gets some personal interaction. I hadn't really considered this at the beginning--but hearing the interesting conversations that go on has convinced me that this is worthwhile. Kids and adults are talking, and they're using rich vocabulary words as the basis for the conversation. Of course, there are some issues to consider. Some kids love the routine and will go through their words at lightning pace. The opposite is also true. I put each week's words on a different color so that they are easy to differentiate. This week, I did remove some of the early October words from the rings of kids who have been absent. Having more than 20 words on the ring at a time makes the process a little unwieldy. I always try to work ahead and have the next week's words copied. For example, right now in my classroom I am adding the words for the week of 12/3 to their word rings. Kids then have the opportunity to see and experience words out of context before they read them in the context of the homework text. My next step is to try to come up with a cumulative assessment. Right now we are working with one set of words at a time. In the future, it will be nice to have long term assessments to capture ongoing growth. Some kids don't finally learn all of the words for a week until several weeks after the whole group quiz. Anecdotally, kids are bringing me their independent reading books to show me vocabulary words that they have found. I am working on a December set, and I'll add flashcards to the previous homework sets. Eventually I'll have the whole year. 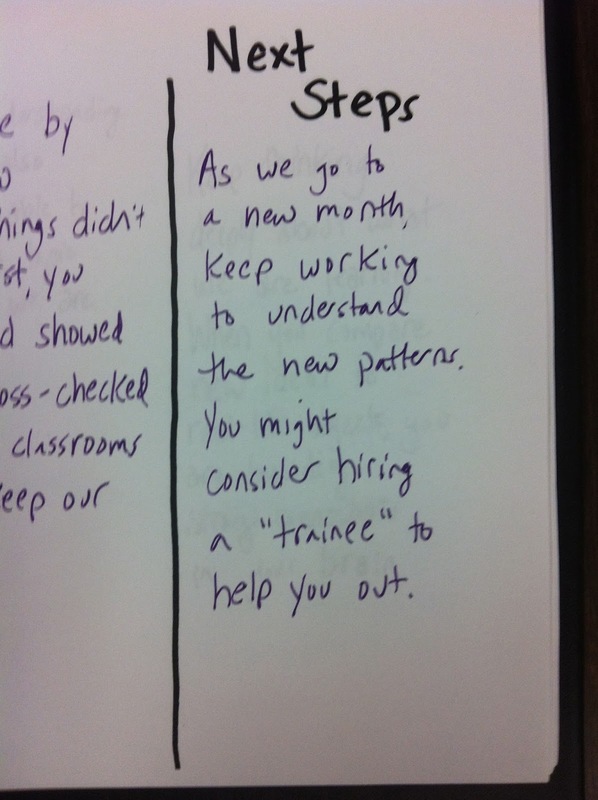 ...and this is the important bit: When starting something new for the classroom, work on just one step at a time. If I had set out to do the homework texts, word cards, and quizzes from the beginning I would have become quickly overwhelmed. By working on it in little steps, I've come to a workable, sustainable routine. Reading words with kids is now something that I do about 3-5 times each day...and it is delightful! 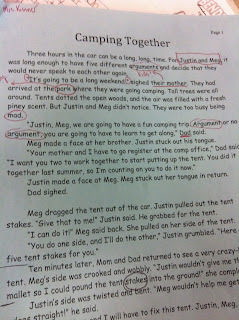 Analyzing stories is a tough task for fourth grader. First they have to read and understand the whole of the story. Then they have to analyze the elements of the story, often making inferences about characters, setting, and theme. Finally they have to put this analysis back into the context of the story as a whole. Over the past few weeks we've been working hard to analyze stories. With different groups of readers, this takes on different aspects. In one group we worked on literature circles with picture books. Here are the pages that I put together for students. Notice that it is a highly structured literature circle, which is very much what fourth graders need at this time of year. Our books included my time-honored favorites from other blog posts: Weslandia, The Memory Coat, City Green, My Rotten Red-Headed Older Brother, and Dragonfly's Tale. I love having students ask each other to share text evidence. When we did discussion groups, it was wonderful to see students holding the books open, lifting them up, and referring to specific page numbers. After their discussions, students worked to complete the open-ended response to write about the theme of the story. With a different group of students, we analyzed setting during guided reading. This graphic organizer helped students to collect details about the time and place of the story. I like how this graphic organizer can be used in two ways. When a setting is known, students can extend their knowledge of the time period and location by using this graphic organizer. When the setting is not known, students can gather details about the setting, and use those details to infer the time and place. (You can read this blog post from two years ago for more on how to infer a setting.) The details on this graphic organizer helped students to think about how a different setting would change the events of the story. Analyzing story elements is an endeavor that takes students deeper into a story, helping them to think about deeper meanings. A strong foundation in this kind of thinking will also yield great results when students begin to compare stories in the weeks ahead. As I was planning for our social studies maps unit, I started to consider my use of digital maps. Teaching students how to use online resources such as Google maps would be a great way to address CCSS 4.7 (interpreting information from various types of sources). But how would I combine these digital resources with our existing map unit? Before we even began the unit, I gave students blank pieces of paper and told them to make a map of a place that they knew well. I didn't give them any further instructions. Skilled maps: These maps reflected a level of map-reading skill and incorporated many of the conventions of the map genre, including map keys and a birds-eye view. One student even included a compass rose. I was a little skeptical about his compass rose and the directionality of his map until he told me, "I know which way is west, because the sun sets outside my bedroom." This definitely represents a high level of mapping skill. Novice maps: These maps represented a novice level of maps and mapmaking. They included few or no conventions of the map genre, and often attempted to show objects as seen from ground level instead of a birds-eye view. Hybrid maps: At first glance, these maps looked like novice maps, with some elements being represented at ground level. But a closer look showed that these students were intentionally combining birds-eye view with ground view to enhance meaning. This is a convention that is seen frequently in maps of amusement parks. Seeing the maps that students created helped me to see what knowledge students were bringing with them. My regular reading display area has become a maps display. I have lots of maps from various vacation destinations, some print-outs, and even some old maps. We used the DOGSTAILS acronym as an organizer to help students look for key elements in paper maps. Kids had the chance to see the many different ways that mapmakers use to represent spaces and places. A few days before the unit began I changed our table names to continents, which sparked a great deal of discussion in the classroom. At the end of Morning Meeting, I chose a student at random to pick a "Destination of the Day"--a location that I would display on the Smartboard with Google Maps. As part of this I showed students how to find a location, how to zoom in and out, and how to use street view. I worked from our traditional social studies lessons for a few days, including an adaptation of this "Maps are Models" lesson from National Geographic and work with the compass rose and directions. For our reading class in the computer lab, I had carefully put together resources to go along with our literature circle and guided reading books. But the students would have none of that. "Can I go on Google Maps?" one student requested. All it took was one "Yes" for the entire class to want to head over to Google Maps. I took a deep breath and observed students interacting with the site. After all, this is what RI 7 is all about! If kids don't get a chance to explore a site, they will never know that it is the place to go to get answers to a specific question. Kids made interesting choices. Of course, every first time user of Google Maps has to find their house. But then what? Some students looked at vacation spots. Others went to find landmarks that they had read about or heard about--the Sydney Opera House (we had looked at a model of it in the previous lesson), the Golden Gate Bridge, the Great Pyramids. The chatter that filled the room was interesting--"How do I get out of street view? How did you get there? How can I get there? I'm lost!" One of our key skills for the map unit is being able to use a scale on a map. Personally, I haven't used a map scale in years, except for when I have been walking and I want to see if a distance is manageable. But there is some value in learning about a map scale, and the way to learn that value is to try out the scale. I started the lesson by teaching students how to use the scale on the paper map. Then, they worked with partners to complete the bland scale worksheet, drawing lines to connect the locations, measuring them, and calculating the distance. This week, we'll wrap it all up with a writing prompt. Students will have to write to show whether they prefer paper maps or digital maps, and then support their opinions with details from our unit. Which will they choose? I'm interested to see. I'm also interested to see how details from our classroom activities find their way into the writing that students produce. Using digital maps has moved from novel activity three weeks ago to standard classroom routine last week. For example--Friday morning I was checking to see who had moved their lunch cards, so I called a student's name. He looked up from the computer in the corner. "Sorry--I'm at the Golden Gate Bridge right now!" he called out. And he was--in Google Maps, in street view. Ah, the joys of open-ended responses. They can be frustrating to students and teachers alike. On the other hand, they can also be exciting and interesting, giving students a chance to show off a little bit of creative thinking. 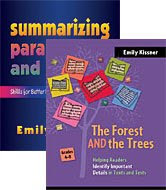 This year, I am working on helping students write the passage-based essays that will be on our new state tests as well as the shorter paragraph responses that are on our current tests. Testing aside, though, the writing of open-ended responses is important for its own sake. Being able to write about a text in an informed way is a necessary skill for a literate individual no matter what the testing environment. Helping students to write these kinds of responses can be challenging. In fourth grade, students are expected to use formal academic vocabulary. For many of my students, this formal vocabulary is entirely foreign. Writing frames are a great way to build their skills with formal writing. Writing frames have a long history in teaching writing. (For more research, check out David Wray's list of articles. The one from 2000, "Developing non-fiction writing: beyond writing frames", explains some cautions to keep in mind when using writing frames.) The idea of a frame is simple--you give writers an outline for how to structure a piece of academic writing. I like to start with frames for writing about our shared activities as a class. Here is a frame that I wrote for students after we attended a concert assembly. When students returned from the assembly, we discussed the frame. What do you notice? What do you think you should put into the blanks? Students then wrote their own paragraphs in their writing journals. 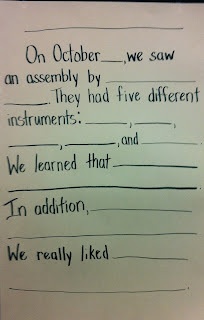 Early experiences with writing frames do go more smoothly when students are writing about experiences instead of texts. When the details are already in their minds, they do not have to juggle going back and forth between text and response. I've found that writing my own context-sensitive frames works better than using pre-made frames. It's worth the effort to try to write the piece in my head and then figure out where to put the lines for student responses. Notice that my frame to the right uses a colon as punctuation. This is not something that most of my students use or even notice. I included it as an experiment to see which students could find it and how they would incorporate it into their own writing. Many of my students had problems with the transitional phrase "in addition"--they simply did not know what it meant. Of course, students had the choice of whether to use the frame or not. Many looked at the frame for some elements and included their own sentences as well. After we wrote the paragraphs, one student (chosen by the popsicle sticks of destiny) filled in the blanks on my frame, while another student looked up the musicians' website and added illustrations. The completed work can then be displayed. The next step, of course, is to use frames for text-based writing. There are times when duplicated frames that students can write on directly are useful. I wrote this frame to go along with a story that students read. This prompt was rather difficult, as it asked students to complete two different tasks. I like to include both easy blanks and more complex blanks in my frames. I do have some students who struggle with writing to the point of tears. The first sentence is such an easy task (just fill in the title of the story) that students can feel some success before diving into the more difficult thinking required by the prompt. When formatting frames, I always use double spacing and picture the handwriting of my student who writes the largest. There are still times when students want to write more than will fit in the blanks, but I show them how to mark with an asterisk * where they want to add more, and use another piece of paper to do so. Much of the literature on frames advises teachers and students to use frames as rough drafts only and have students rewrite their responses. However, I am trying to do open-ended responses each week. Rewriting the entire response would take approximately 1.2 million years for some students, and I just don't have that kind of time. Instead, I settle for having students read the entire frame aloud to me. Some students asked, "What if I look at the frame, and use some of it, but write it all myself?" Well, that's just wonderful! Of course that is fine! So I did see many hybrid responses. Interestingly, the readers who did not use the frame had serious trouble with crafting a topic sentence. This shows me that I need to spend time on this in the future. Students who used the frame had no trouble adding "cool" or "interesting" to finish out the topic sentence. Another way to move students away from a frame is to project the writing frame on the board, but not give students a copy. Some students will look up at the board and use what is given, while others will not. As the year goes on, I vary what is given to students on the frame. Sometimes it will just be a topic sentence and concluding sentence. Sometimes the frame will include the information and have students fill in the transitions. All of these variations help me to see what kinds of writing techniques are within the grasp of students and which are still developing. I have a fabulous class this year with some very creative kids. Some have started a Skylanders Club in which they meet to discuss the game at recess. Well, one student asked if he could type up some homework for students in the club. I was amused to notice that his "homework" included a writing frame for other students to complete. 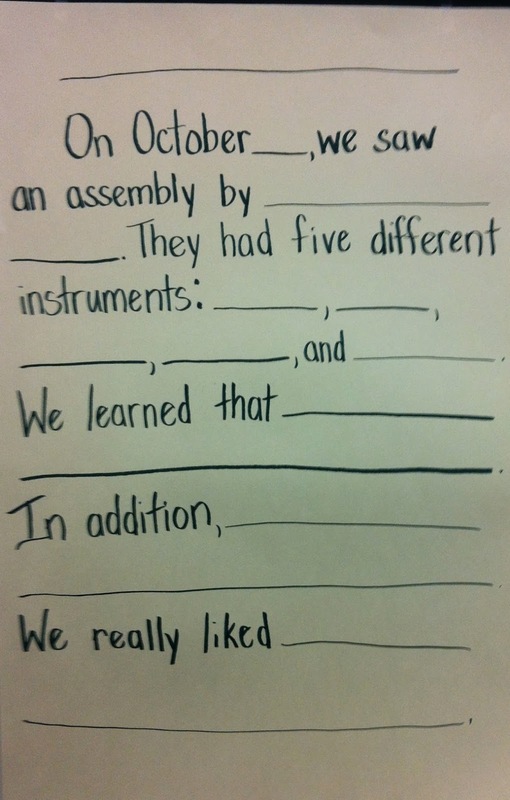 -The writing frames used above (and two others) are included in my October Homework Packets. -Summary frames are included in selected activities in my text structure materials: Chronological Order, Description, Cause and Effect, Problem and Solution, and Compare and Contrast. One of the main challenges of the beginning of the year for me is keeping my focus on reading and thinking. It is easy to get wrapped up in classroom decoration ("I must buy more sparkly fish!") and administrative details ("I must print out at least 10 class lists and set up my substitute folder and make a spreadsheet for intervention groups!"). But I make a conscious effort in these first few weeks to save two slots in my working memory. (It's hard!) One slot I reserve for students--for the kids who are in front of me, right now, at this time. The other slot I reserve for deeper thinking about what the kids are doing and how they are processing. What materials am I giving to students? What do these materials say about the classroom and the work that we will do here together? The best way that I have found to help readers self-monitor is to use the "click" and "clunk" strategy. (Here is an article that explains it nicely.) This strategy is perfect for the start of the year because it focuses on micro-level understanding. Do I understand this sentence? If the answer is yes, the sentence "clicks". If the answer is no, it "clunks". Then, readers can try to put together the meaning of the entire passage. Here is a little graphic organizer that I created to help students think about clicking and clunking. As you can see, every clunk leads to some kind of action on the part of the reader. The next step is to put this into action with a passage. This year I'd like to try to use the first few paragraphs of The Story of the Amulet by Edith Nesbit. (If you're not familiar with E. Nesbit, find her books online...they are over 100 years old, but so influential in the world of children's fantasy!) After students read it and monitor their clicks and clunks, they will draw and share pictures of the world that they built in their minds. My husband, who teaches third grade, found the passage to be a little hard for his students, so I wrote a new passage for him. He has a robot/space theme going on in his classroom this year. Whatever passage you choose, start with something that provides a bit of challenge for students. Talking about their clunks and how they solve they will help students to realize that reading takes risk--but that the risks can be rewarding. Good luck as you start your school year! Wish me luck as I attend my first rounds of meetings and try to save slots for students and deeper thinking. This week I finally finished a new September reading homework packet. Four more weeks for October are on their way. For more texts that focus on visualizing, try out the Visualizing PowerPoint and Activities packet. If you are finding that your readers are having lots of clunks, try out the Making Inferences with Transitional Readers packet for focused work on inferences and visualizing. I spent today working in my classroom. The week before school often brings a dizzying mix of grandiose planning and practical abandonment. "My classroom will be the most beautiful classroom ever," I think at the start of the week. By midweek, as I have sorted boxes and boxes of books (and culled the classroom library so the books will actually fit on the shelves! ), my ambitions are less grand: "I want to have a classroom that does not have every inch of space covered by boxes and random debris." In the last few weeks of summer, I've been working on creating some new reading packets. In my house we've been listening to Harry Potter on CD this summer, which has led us to trying out some different butterbeer recipes. 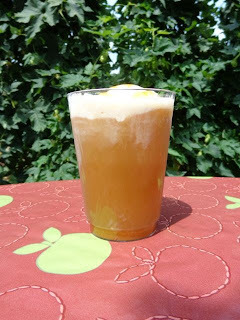 I decided that a fun kids drink would be a good procedural text, so my sons and I experimented with a caramel apple float. We were trying to get the taste of a caramel apple without the stickiness--our recipe turned out pretty well! And, of course, I was able to turn the whole thing into a procedural text that kids might enjoy. Tomorrow--more work on my classroom! I will probably change my theme from "Under the Sea" to "This Is A Classroom Where People Learn". And there aren't boxes everywhere.